The following example shows how the three parts of a query operation are expressed in source code. The example uses an integer array as a data source for convenience; however, the same concepts apply to other data sources also. This example is referred to throughout the rest of this topic. The following illustration shows the complete query operation. 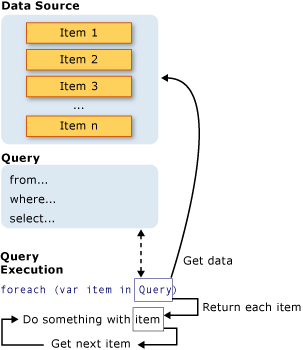 In LINQ the execution of the query is distinct from the query itself; in other words you have not retrieved any data just by creating a query variable. In the previous example, because the data source is an array, it implicitly supports the generic IEnumerable<T> interface. This fact means it can be queried with LINQ. A query is executed in a foreach statement, and foreach requires IEnumerable or IEnumerable<T>. Types that support IEnumerable<T> or a derived interface such as the generic IQueryable<T> are called queryable types. With LINQ to SQL, you first create an object-relational mapping at design time either manually or by using the LINQ to SQL Tools in Visual Studio in Visual Studio. You write your queries against the objects, and at run-time LINQ to SQL handles the communication with the database. In the following example, Customers represents a specific table in the database, and the type of the query result, IQueryable<T>, derives from IEnumerable<T>. For more information about how to create specific types of data sources, see the documentation for the various LINQ providers. However, the basic rule is very simple: a LINQ data source is any object that supports the generic IEnumerable<T> interface, or an interface that inherits from it. Types such as ArrayList that support the non-generic IEnumerable interface can also be used as a LINQ data source. For more information, see How to: Query an ArrayList with LINQ (C#). The query specifies what information to retrieve from the data source or sources. Optionally, a query also specifies how that information should be sorted, grouped, and shaped before it is returned. A query is stored in a query variable and initialized with a query expression. To make it easier to write queries, C# has introduced new query syntax. The query in the previous example returns all the even numbers from the integer array. The query expression contains three clauses: from, where and select. (If you are familiar with SQL, you will have noticed that the ordering of the clauses is reversed from the order in SQL.) The from clause specifies the data source, the where clause applies the filter, and the select clause specifies the type of the returned elements. These and the other query clauses are discussed in detail in the LINQ Query Expressions section. For now, the important point is that in LINQ, the query variable itself takes no action and returns no data. It just stores the information that is required to produce the results when the query is executed at some later point. For more information about how queries are constructed behind the scenes, see Standard Query Operators Overview (C#). Queries can also be expressed by using method syntax. For more information, see Query Syntax and Method Syntax in LINQ. The foreach statement is also where the query results are retrieved. For example, in the previous query, the iteration variable num holds each value (one at a time) in the returned sequence. Because the query variable itself never holds the query results, you can execute it as often as you like. For example, you may have a database that is being updated continually by a separate application. In your application, you could create one query that retrieves the latest data, and you could execute it repeatedly at some interval to retrieve different results every time. To force immediate execution of any query and cache its results, you can call the ToList or ToArray methods. You can also force execution by putting the foreach loop immediately after the query expression. However, by calling ToList or ToArray you also cache all the data in a single collection object.